The 3 Lucks sounds a lot like scratch card game or a Las Vegas one eyed Jack, doesn’t it? Regardless, they are the three forces at work in your life, that at any given time can explain the Why, When and Where. Why are you born in the UK? This is your fate at birth. Why are you living and working in London? This is free will. Why do you have a hard time saving money and getting a lasting relationship? This might be due to your flat Feng Shui. 3 factors that altogether define the Who: that is YOU, a truly unique individual. The 3 Lucks: Heaven, Human, Earth and YOU. Copyright Laurent Langlais. 1. Heaven luck: what is your playground? The concept of Heaven luck refers to destiny. 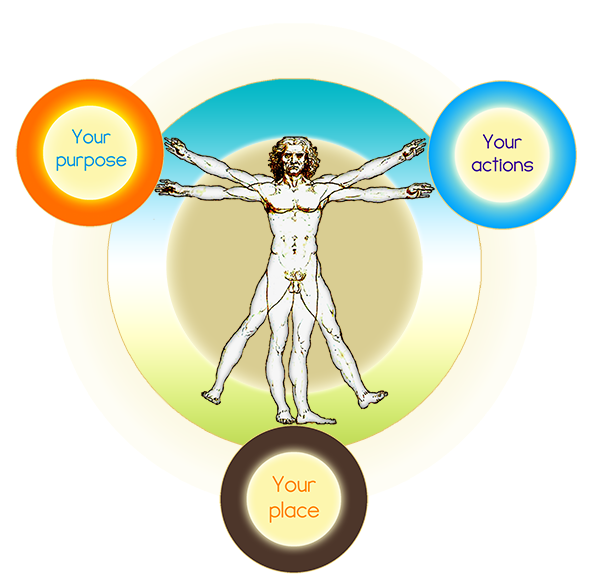 There is a mapping in all our lives, determined prior to our birth, and influenced by our karma. Hence the concept of “Heaven luck”: this choice is made before we can make conscious choices. It doesn’t mean that we had no part in it, as it was decided mostly based on our previous karma! The form of Chinese astrology called Bazi or Four Pillars of destiny allows us to see how the Heaven luck works in our lives. It gives us a blueprint, our boundaries as well as our potential. Here is an example: in term of wealth and fame, we can say that the philanthropic Richard Branson, Virgin CEO, or the brilliant Jodie Foster both have has a bigger playground than, let’s say, someone who is born and spend his life in a favela. Such a person can still transform its destiny with good deeds and dedication; but the game is on a totally different scale. Karma has set up a different game at birth…It is just your playground. And with good will and good deeds, you can get a bigger one; but for now, it is your personal karmic sandpit. This is what we call fate, rather than destiny. All of this, as well as your strengths and challenges, your affinities, your skills, your life mission etc. are seen through your personal Bazi analysis. With this information, you can then make informed choices: this is the free will part that takes us to the second luck, human luck. 2. Human luck: cupcake, ice cream or no dessert today? With such a mapping of our lives as seen in Chinese astrology, you may think that you have no free will left. Far from it! Traditionally a Taoist was trying to be virtuous and to live according to a code of conduct and to take limited action. Nowadays our lives offer much more options and endless choices, which all transform our destiny. Certainly in old times, they did not have to choose everyday between fast food or a healthier diet, chat on Facebook or working, buying some new clothes or giving to a charity. Or, as I call it, choosing the right dessert. We live in the time of instantaneity and our karma and destinies have transformed too: karma is faster! 3. Earth Luck: should I move to Manchester or stay in London and Feng Shui my flat? Finally, another major factor in our lives is the influence of Earth luck. The places where we live and work send blessings, curses or blessings in disguise, in subtle or not so subtle ways. Earth luck is the one Feng Shui deal with. For most people who are not aware of Feng Shui, it is not possible to know which part of their life comes from their place. However all of us have seen very different outcomes after we moved in a new place. Likewise, Feng Shui can make or break a business, even if it is a successful franchise. There are two levels to account for, at least: what the city brings to you on a personal level (type of Chi and astrocartography) and does the Feng Shui setup of your home or business work for you? It might be that London does not work for you at a city on a destiny level; but before discarding it, we shall see what can be done on your home (house or flat/apartment) or on your business premises! Here is a real life example for you: I once scouted for a suitable apartment for me in London, UK. Of course I always visited them with my Chinese compass, the Luo Pan, to see if they were compatible with my own Chi. A real estate agent asked me what I was doing. Once I explained, he told me that they had a house in the agency they call “the divorce house”. 6 couples moved in, and one after the other ended up divorcing…While of course their karma and also free will attracted them to such a place, it hard not to acknowledge a specific energy at work here! One that can be positively transformed by the use of the proper Feng Shui, still. You don’t have to be a victim of this invisible Earth Luck. The great strength of Feng Shui is that properly designed, it works for you day after day. Once your home and business are harmonized, you already regain some control on your life and can focus on improving the rest. 4. Melting pot: the 3 lucks at work together! Those forces should not be considered separately as they endlessly interact with each others. For example, let’s consider that you are about to choose a new house or apartment to live in. Your own timing is changing, as seen through your Bazi chart. This means that the influence of your Heaven Luck bring a different vibe, and choices already: this period is more challenging for now. Because of this different influence, you might end up choosing a nice house but with hidden problems. Problems that will resonate especially with you once you move into this new place…The house is another trigger in your life, in other words. However, if you know your Bazi and own timing; then you can scout for the right house at the right time. During in month when you are less inclined to make mistakes of judgment. Furthemore, as you know an excellent Feng Shui master who works internationally (don’t you? ), and who has already advised you on your chart, you can then work on choosing the right place and redesigning it to your needs together. the place where you live and work will also bring greatness or challenges. It’s a team work really! I give you a diagnosis but also all the solutions: you have the power to change your fate and create a beautiful destiny for yourself, right here, right now. Ready to get to know your secret self and to go for this fantastic change? Then contact me now!